For National Garden Month and our exhibition, Cultivating America’s Gardens, take a stroll through some of the botanical gems in our Special Collections. Interested in more plants and flowers? See our previous post about the Botany and Horticulture Library. Gardeners experience at first hand the wonder and pleasure – as well as the occasional mystery and frustration – to be found in the world of plants. This is true as far back as history records and even further, for plants are the essential foundation of the world we live in; they provide our food (and the fire to cook it), medicine, and materials for clothing, tools, homes, and furnishings; they have sustained and enhanced human life both physically and aesthetically through our entire history as a species. In art and myth it is clear that the earliest civilizations – in Egypt, the Middle East, India, Asia, and the Americas – cultivated not just food crops and medicinal plants but also pleasure gardens, celebrating them in decorative vases, wall paintings, and textiles, as well as in song and story. But humanity’s dependence on and relationship(s) with plants in the past two thousand years and more can be known most substantively and usefully through written documents – manuscripts and printed books. The Smithsonian Libraries holds a treasure trove of books about the world of plants in several mutually reinforcing collections: the Botany and Horticulture Library, the Smithsonian Tropical Research Institute Library, the Smithsonian Environmental Research Center Library, and for books published before the mid-1800s, two rare-book rooms, the Joseph F. Cullman 3rd Library of Natural History and the Dibner Library of the History of Science and Technology. Page 10 from Leonhard Fuchs’ De historia stirpium (1542). 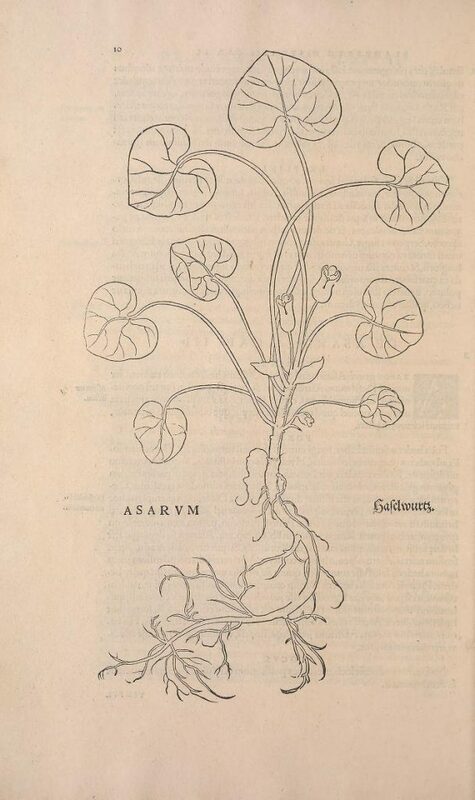 The Cullman and the Dibner libraries hold the earliest printed books on our botanical and horticultural heritage, beginning with Renaissance editions of the ancient Greeks and Romans – the works of Aristotle, Theophrastus, Pliny the Elder, and Dioscorides – and the medieval herbals known generically as the Gart der Gesundheit and the Hortus sanitatis (in German and Latin, respectively, both translated roughly as “Garden of health”). They in turn were followed in the 16th century by the encyclopedic works of Otto Brunfels (Herbarium vivae eicones, 1530-1536), Hieronymus Bock (Neue Kreutterbuch, 1539 and numerous subsequent editions), and Leonhard Fuchs (De historia stirpium, 1542). Combining as much as could be gathered from the past with first-hand observations in northern Europe and the discoveries of explorers in the Americas and Indies, these printed tomes collectively launched modern botanical studies in the West. First-person accounts of previously little-explored lands and botanical discoveries thrilled arm-chair gardeners, working horticulturists, and scholars alike, although the prices tended to limit their audiences and resulted in very small print runs. At the practical, applied level where horticulture reigns, interest in garden design and new techniques of cultivation blossomed along with the explosive increase in exotic, previously unknown plants. The “long” 18th century (from about 1690 to the early decades of the 1800s) is arguably the period of the most interesting botanical explorations, the most important advances in taxonomy and classification, and the most beautiful examples of the illustrated botanical book. Among the most impressive volumes were Mark Catesby’s Natural history of Carolina, Florida and the Bahama Islands (1731-1743 [i.e., 1729-1747], with 220 hand-colored etchings in folio), and André & François Michaux’s Flora boreali-americana (1803) and North American sylva (1814, with most of the plates color-printed from drawings by Redouté). Many other works resulted from both individual, commercial, and, increasingly, government-sponsored expeditions for scientific exploration and collecting by Bougainville, Lapérouse, Dampier, Cook, Vancouver, and others. Some of the most active of these naturalists were the numerous students and “disciples” of Carl Linnaeus, including Pehr Kalm (in North and South America), Frederik Hasselquist (in the Middle East and northern Africa), Carl Peter Thunberg (in Asia), Anders Sparrmann (in southern Africa and Oceania), and Daniel Solander, who served as naturalist on Captain James Cook’s first voyage round the world (1768-1771) and subsequently as assistant to Sir Joseph Banks, a founder of Kew Gardens. 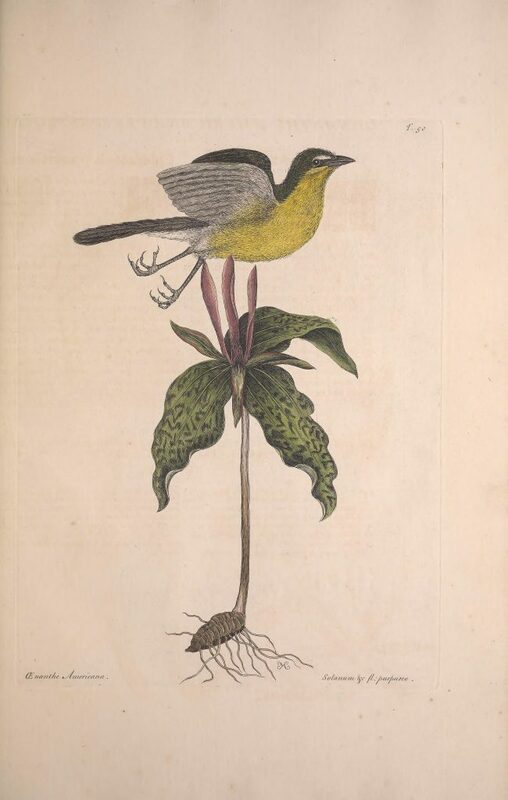 Enanthe Americana (Yellow-breasted chat) from Mark Catesby’s The Natural History of Carolina, Florida, and the Bahama Islands (London, 1729-1747). The flood of previously unknown plants from all over the globe created chaos in the European scientific world, giving rise to a Babel of conflicting designations and overwhelming the existing botanical categories and classifications. By the mid-1700s the supremely important works of Carl Linnaeus (later, von Linné), a professor of botany at the University of Uppsala in Sweden, brought order to chaos. His “sexual system,” based primarily on the number of male stamens in the flower structure, was a simple and effective way of identifying species, although it produced admittedly artificial groupings and was eventually replaced by more natural systems that reflected true familial, evolutionary relationships. But Linnaeus’s numerous books – most notably his Genera plantarum (1737) and Species plantarum (1753) – established a system of nomenclature that gave science an international language for identifying plants. 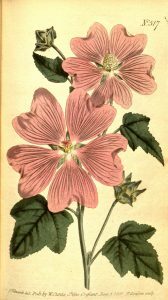 Linnaean binomials, or two-word names, consist of the genus – like a surname, designating a group of closely related plants – which is always capitalized, and the species – like a first name, designating the individual or specific kind of plant – which is never capitalized, even when it is a proper name, and both are italicized as a foreign term based on Latin and Greek words and forms (for example, Quercus rubra, the red oak, or Mertensia virginiana, Virginia bluebells). The seeds and plants that survived lengthy ocean voyages back to Europe were eagerly propagated in commercial nurseries and university gardens; botanical studies flourished, and on a more practical – and crucial – level gardening manuals proliferated as experiment and experience produced improvements in horticultural knowledge and cultivation techniques. Among an ever-growing body of works in the subject, Philip Miller’s Gardener’s dictionary (1731, and numerous subsequent editions through the 18th century) stands out for its comprehensiveness and authority, based as it was on Miller’s work growing plants from all over the world at the Chelsea Physic Garden. By the end of the century and through our own times, a variety of garden styles and horticultural focuses have flourished, from formal designs based on French and Italian models, through victory gardens as a patriotic way of feeding a family and supporting the country during wars, to the recent appreciation of native wildflowers and shrubs in a naturalistic ecosystem. And for each of them in turn there have been books to inform, entice, and sometimes simply please the eyes of their many readers and gardening enthusiasts. The Smithsonian Libraries, in support of botanical research and horticultural practice, and our many benefactors and donors have built a fascinating collection of books on this most fascinating of subjects, and I hope that you will enjoy exploring the Cultivating America’s Gardens exhibition as it opens a door into this wonderful world.